Remember Bradie James? 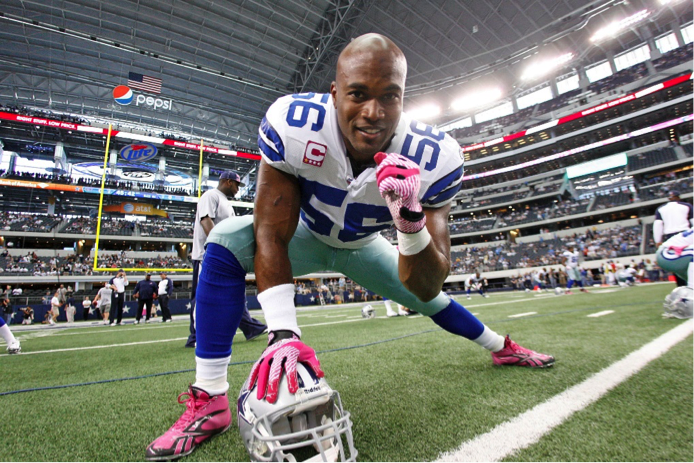 Longtime Cowboys linebacker who officially retired a Cowboy last year? Since his retirement, Bradie has settled in Dallas, stayed close to us here at the Cowboys and is working harder than ever to raise awareness for breast cancer and fight for women’s health through his Foundation 56. Bradie started Foundation 56 in 2007 while he was still a player in the league, with the goal to raise awareness for the importance of breast cancer screenings and to provide mammogram services for women who may not otherwise have access. Today, Foundation 56 partners with hospitals both in the DFW Metroplex and in Louisiana – Bradie’s home state – to operate a fleet a mobile units, traveling through lower-socioeconomic neighborhoods to provide mammograms on the spot and for free. All has been an effort out of love for Bradie’s mother, who died from breast cancer in 2001. On Oct. 17 (the same day as the Komen Dallas Race for the Cure! ), Uber will partner with Dallas Brew Scene to host the first-ever Uber Dallas Brew Crawl for Breast Cancer, proceeds of which benefit Foundation 56. Tickets for the Uber Dallas Brew Crawl for Breast Cancer may be purchased for $50 here. The event begins at noon – just in time for you to complete the Komen Dallas Race for the Cure, recuperate and get on to your next life-saving, breast cancer awareness-raising event! To learn more about what the Cowboys have in store for Breast Cancer Awareness Month, and for information on how to join TEAM COWBOYS in the Komen Dallas Race for the Cure, click here.